*Deparment of Preventive Medicine and Division of Haematology/Oncology, Robert H.Lurie Comprehensive Cancer Center, Northwestern University Feinberg School of Medicine, 710 North Fairbanks, Room 8340, Chicago, IL60611. For the evaluation of IHC slides using ImageJ, images can be captured onto the hard drive of the workstation computer. Thereafter, captured images can be opened in NIH Image/ImageJ for evaluating indices of positivity on IHC slides as well as fluorescence images.4,5 Counting can be done in two ways off the image- the cell counter technique (analogous to the hematology differential counters) and the area method. In the `cell counter method', cells can be counted off directly from the screen by placing marks of different colors onto positive and negative nuclei by mouse clicking. Finally, ImageJ will generate the IHC index automatically. An advantage of this technique over conventional counting across the microscope is its reproducibility and accuracy. With the `area method', the total area occupied by positive (brown) nuclei and negative (blue) nuclei can be estimated by setting a "threshold" using ImageJ's thresholding tool for selection of these nuclei separately. From this nuclear area data, the positive IHC index for that image can be calculated. One another useful feature of ImageJ is the `ROI Manager' (Region Of Interest Manager) where the pathologist can specify and draw out areas to be evaluated, editing out the unwanted elements. All data can be imported into Microsoft Excel worksheets to give a summated set of results for a single slide. Noguchi M, Kikuchi H, Ishibashi M, Noda S. Percentage of the positive area of bone metastasis is an independent predictor of disease death in advanced prostate cancer. 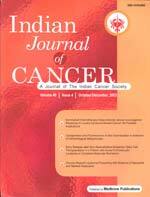 Br J Cancer 2003; 88:195-201. Ho CC, Yang XW, Lee TL, Liao PH, Yang SH, Tsai CH, et al. Activation of p53 signalling in acetylsalicylic acid-induced apoptosis in OC2 human oral cancer cells. Eur J Clin Invest 2003;33:875-82. Tchoukalova YD, Harteneck DA, Karwoski RA, Tarara J, Jensen MD. A quick, reliable, and automated method for fat cell sizing. J Lipid Res 2003;44:1795-801. Wu KH, Madigan MC, Billson FA, Penfold PL. Differential expression of GFAP in early v late AMD: a quantitative analysis. Br J Ophthalmol 2003;87:1159-66. Katayama A, Bandoh N, Kishibe K, Takahara M, Ogino T, Nonaka S, et al. Expressions of matrix metalloproteinases in early-stage oral squamous cell carcinoma as predictive indicators for tumor metastases and prognosis. Clin Cancer Res 2004;10:634-40.